Studio is located on the 2nd floor in a new building with elevator. Clear view of the garden. Quiet, decor, neat, secure residence with 2 digicodes and caretaker. It's a quiet street near the metro La Chapelle, a 10-minute walk from the Sacre Coeur Basilica (Montmartre) and the Place du Tartre, with numerous painters. This is a lively and cosmopolitan area. In the neighborhood you will find supermarkets, grocery stores, bakeries, butchers, bars, restaurants and takeaway restorations. A little further away are 3 metro stations, theaters and the lively Pigalle where you can visit the Moulin Rouge. You can also visit Ice Bar at Hotel Cube, the theater of the White Queen, the Bouffes du Nord theater and the Church of St. Bernard Chapel. These are close (3 or 4 minutes walk). 3,5m2 bathroom with bath, 2 mirrors, toilet and sink. Additional provisions: Freebox, phone, internet, hot water and district heating. I would have given this property 4 stars because the inside of the apartment had its charm and the location was pretty vibrant. The reason I'm giving it 3 stars is because there was a lack of clarity on the final price of our stay. The owner was wonderful at communicating with us but when we got there they asked for a deposit which we had not discussed before. It was refundable but it didn't sit well with me that it hadn't been discussed before as it was a large fee. We agreed to our price and dates of stay with the manager several months before our trip but it seems like unexpected fees came up when the time approached. There was also a "service fee" added which we had not discussed before. Overall good experience just was not too happy about the unexpected fees. I would recommend but make sure he price is as clear as possible! good morning, thank your for your appréciation. I explain you why i ask, a deposit (we have a lot of furnitures) and also it is writen on the site when your reserve, you have to pay a deposit, i refound you all your money. the reason for the fee is that you arrive one day late, and i explain you why i can not refund this day, it is the rules; you have to read conditions in the site of Abritel. My mother and I stayed here for a couple of nights before an emergency at home cut our stay short. The owner was so kind and understanding with our circumstances and we are grateful for that. The apartment was lovely and bright and its vicinity to the metro was very convenient! We are still disappointed that our stay was postponed but we are thankful for our great experience here! The apartment looks exactly like it does in the posted pictures. It’s clean and cozy, with a big comfy bed, a good-size bathroom and a well-equipped kitchen. The kitchen is small but you can easily make more room by pulling out a butcher's block on wheels. Space-saving dressers, racks and shelves placed perfectly throughout the apartment gave us plenty of space to spread out. The Wi-Fi works well and we were able to find a few shows in English on the large flat-screen TV. 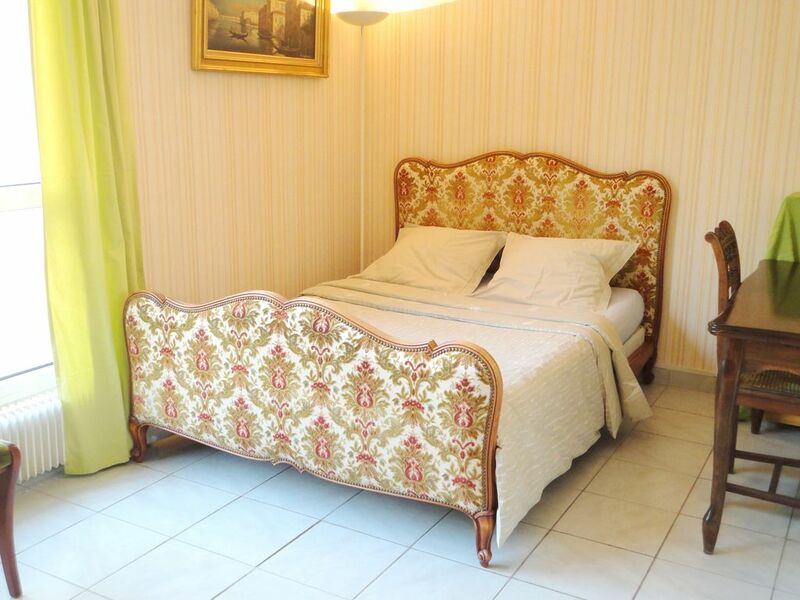 The apartment is conveniently located between the La Chappelle and the Barbes Rochechouart Metro Station. There are a few grocery stores, bakeries and restaurants nearby. The owner is kind, flexible and generous with her time. Finding grocery stores, patisseries and restaurants was quick and easy after she outlined everything on a local map. She also offered great tips on how to navigate the city. O studio é bem mobiliado, tivemos a possibilidade de cozinhar e era bem aconchegante. Mas para chegar até o imóvel tínhamos de passar por um local escuro, onde até mesmo os pedestres nos falavam para ter cuidado, me senti insegura e isso prejudicou um pouco a estadia, pois por isso voltávamos sempre cedo para o studio. Studio meublé avec soin dans un quartier vivant. Le studio est coquet .Nous avons été accueilli de façon très professionnelle par une collaboratrice de M. kader .Le quartier est très cosmopolite et bien déservi par le métro et le R E R. Un petit four portatif serai le bienvenu pour compléter une vaisselle de bonne qualité. Si vous voulez sortir du Paris bourgeois n'hésitez pas à visiter ce quartier très animé. Apartamento muy completo, limpio y exacto a las fotos. Fuimos a Paris a disfrutar una semana, el apartamento de Kader es exactamente lo que aparece en las fotos, y esta muy limpio. Apenas hablamos con él, sólo la llegada y la vuelta, no fue necesario, el apartamento esta completo, vajilla, secador de pelo, abre botellas, tijeras, toallas,... Lo único malo es la zona, mucho musulman y extranjero, pero en 5 minutos estabas en el meollo de todo. Apartment located 150m from metro La Chapelle (line 2) and Gare du Nord 500m (RER B, D and E subway lines 4 and 5). Caution demandée 250 euros, arrhes à la réservation 100 euros, remise des clés par le propriétaire sur place. Le locataire paye le solde de la location et la caution dès son arrivée, à la remise des clés. La caution est remboursable au départ. Les charges (eau, électricité) sont comprises dans le montant de la location à concurrence d'un forfait pour 2 personnes : de 250 L par jour d'eau et de 4 kW par jour d'électricité.